Many schools, clubs and leisure centres across the UK are choosing to install multi use games areas as part of their sports facilities to allow users to take part in a number of different sports all on one surface. When installing an all purpose sports facility, it’s important to distinguish between the different activities being played on the surface to ensure accurate game play and scoring, this is where MUGA line marking comes in. We can apply anti slip paint coatings for multi use games area surfacing in a range of colours, as well as professional sport and games markings in contrasting colours for different sports including tennis, netball and basketball. 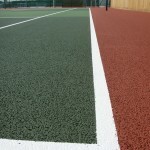 Having top quality line markings ensures that your sports surface meets the relevant ITF, LTA and SAPCA regulations for sports facility safety and performance. 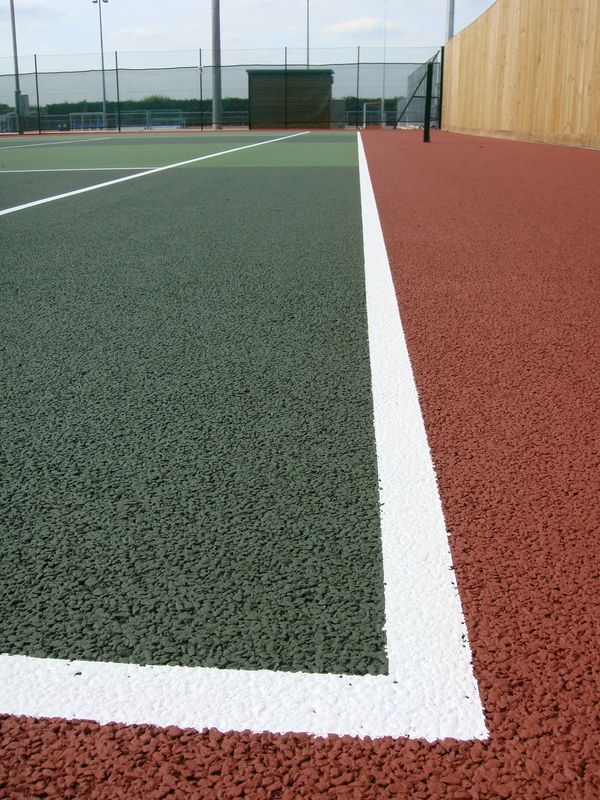 Our team can install these painted lines to many different facilities and hard courts. There are a range of different colours available so it is easy to create a multipurpose facility which can be used for lots of activities. Please fill in our contact form today if you need some further information on these services. One of our friendly experts will get back to you with details on the costs and different products that we offer. 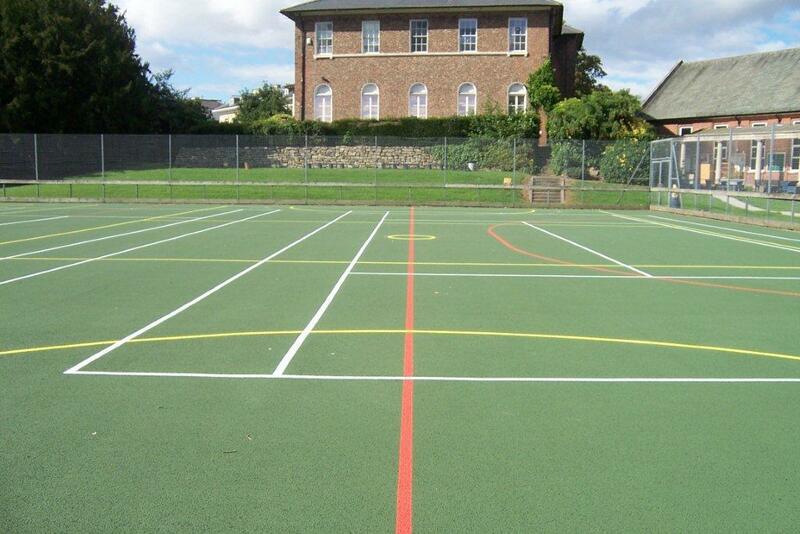 It’s important to have MUGA line marking applications carried out by specialist sport surfacing contractors; this will make certain that the lines are accurate in terms of sizing and dimensions so that they provide accurate game scoring for all activities. 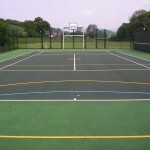 Sports court lines are applied in a spray coat of either polyurethane or acrylic anti slip paint, these create slip resistant qualities which enhance the game play characteristics by improving traction for sports like netball and tennis. A range of slip resistance grades can be created by adding different amounts of sand and aluminium oxide to the paint. It is vital that you choose the right type of paint for your multi use games area to make sure you get the best quality results in terms of performance and safety characteristics. Before applying any new paint coatings to a polymeric or macadam court, it’s vital to carry out a thorough clean of the surface to remove and dirt or loose stones and ensure that the paint application is smooth and seamless. If the court isn’t completely clean, when the paint is applied it won’t stick evenly and can peel off in certain areas where there is dirt stuck to the surfacing. 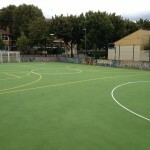 More information on the cleaning process for a multi sport surface is available here – https://www.sportsandsafetysurfaces.co.uk/sports/multi-use-games-area/cleaning/ so feel free to have a look at this page. 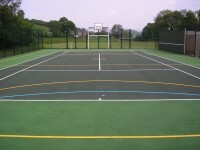 The MUGA surface line marking costs will usually be included as part of the price for a full multi use games area construction and installation project. Prices can vary depending on the size and dimensions on the area, the type of paint you choose to have applied and the number of sports you wish to have the court marked out for. Compromises could be made on all of these variables to help provide you with a quote which fits within your budget but still gives you a fantastic outdoor facility which will be enjoyed for a long time. Take a look at this video which shows a multi use court painting project that we carried out in Lancashire. The existing tarmac surface was slippery and didn’t provide the right performance qualities, so we carried out a thorough clean for the whole area and applied a new paint coating with specialist lining. The client chose to have the anti slip coating applied in blue acrylic paint with white lines for netball. Keeping your games surface well maintained will also cut costs for MUGA line marking as it reduces damage and weathering to the flooring. This therefore prevents the need for repainting and reline marking of the court in the future. Regular cleaning and maintenance could include brushing, pressure washing and generally removing any debris or contamination from the surface to prevent loss of drainage and maintain the high performance and safety standards of the facility. 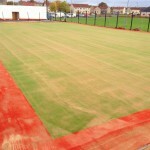 This work is often done to both macadam court surfaces and polymeric EPDM rubber flooring which are specifications that we also install in schools and sports clubs. The regular maintenance helps to ensure that the surfacing is safe and doesn’t become slippery or contaminated with moss. It will also help to maintain the porous qualities of the flooring so that water can drain away properly instead of causing puddles or flooding. 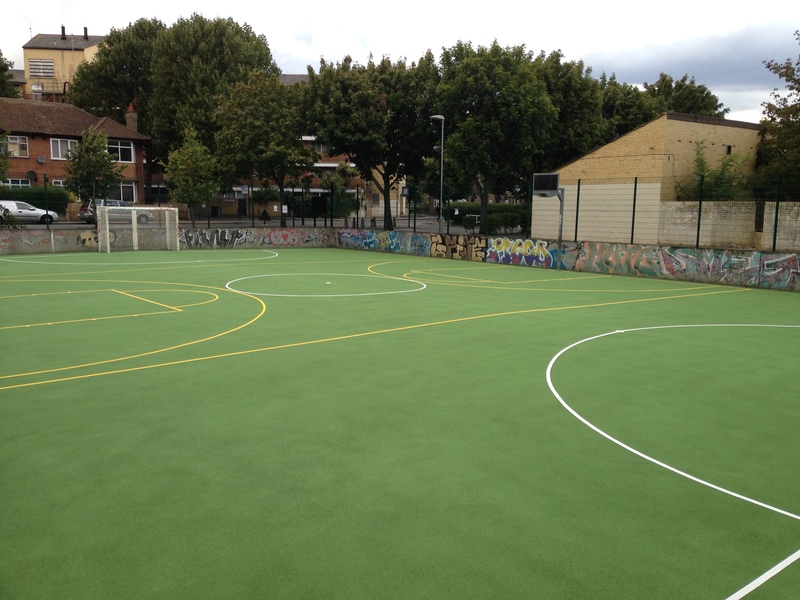 We can be flexible on prices for applying coloured markings to multi use games areas, as well as maintenance so that you get a great value service which meets your requirements and fits within your organisation’s budget. 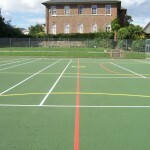 Please make sure you use our contact form if you want to discuss prices and installation of MUGA line marking. Include a project post code and area size for the work and we’ll come back to you with a price quotation and some product sheets on painting and markings.